A pretty funny and entertaining movie, despite its predictable plot. This movie is surprisingly pretty good. It’s the first time I’ve been able to say that about an Adam Sandler movie in a long while. But here, you’ve got a pretty creative premise about a world where monsters can exist away from humans, and just be themselves. That world is inside the hotel. Everyone here either hates or is afraid of humans, or both. So there is a clear no humans rule. And of course, that means that it’s only a matter of time before a human walks in and we get to see what happens. Dracula (Adam Sandler,) runs the hotel, and his teenage daughter, Mavis, wants to go out into the world to meet the humans. When one of them comes to the hotel, her problem is solved. Only it’s up to Dracula to do everything in his power to keep these two apart, including disguising Jonathan (the human,) up to look like a monster. A lot of fun ensues. The movie isn’t super smart, the way that Disney / Pixar films are, (after all, the forbidden romance is a very familiar story,) but there’s enough here to laugh and appreciate. Animated movies are generally pretty fun. They have to be considering how much work goes into making them. If the plot isn’t at least built on a creative premise or the jokes aren’t funny, then it’s a recipe for disaster. And these movies know that, so they do whatever they can to avoid falling into these traps. They also try to exist on a playing field where there’s both humor for kids and adults, at the same time, in ways that other kids movies don’t (just watch one of those Diary of a Wimpy Kid movies.) But with animated movies, the challenge is just how good and creative can it be. Disney and Pixar do it better than anyone else (two years in a row now they’ve knocked it out of the park with Moana and Coco, consecutively.) But there’s plenty of great animation being made by other studios too. Just look at something like Kubo and the Two Strings from Laika, the house of stop motion animation. 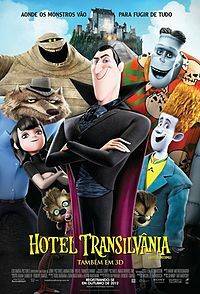 Hotel Transylvania isn’t on the same level as any of those other movies, but it is still a pretty decent film. The cast is composed of familiar actors who are friends with Adam Sandler. There’s Kevin James, Andy Samberg, David Spade, and Steve Buscemi all on hand here. And each one of them is playing a monster. Sandler is the star of the movie, playing Dracula. James plays Frankenstiein. Buscemi plays the Wold Man. Spade plays the invisible man. And Samberg plays the one character who is not a monster at all, but a human. The movie takes all of these monsters, that we are familiar with, and puts them into a hotel. That’s the unique premise. It’s not that having a bunch of monsters together is such a great idea, tons of movies have done that before. It’s the notion of them all being on vacation and coming to stay in this hotel. And there is a lot that is worked out here, to merge the monster world with the hotel world and make it seem funny. Instead of maids who clean the room, the hotel employs witches who do the job. Instead of “Do Not Disturb,” signs, the hotel uses shrunken head which hang on string from the door knobs and tell people walking by, either to come in and clean or to go away. There are even jokes about skeletons (apparently reaching through ones ribcage is like touching them inappropriately,) and about zombies. It’s all worked out in this movie. The hotel is actually a getaway so that monsters can escape the world of humans. In fact, the number one rule of the hotel is no humans. So right off the bat, you can tell what is going to happen. Yes, a human will infiltrate the hotel, and yes the monsters will learn to be accepting of him. Talk about an allegory for discrimination and learning acceptance. Is it supposed to be racism here? Homophobia? Sexism? Cultural clash? All of the above. And yes, it’s predictable, but so what. 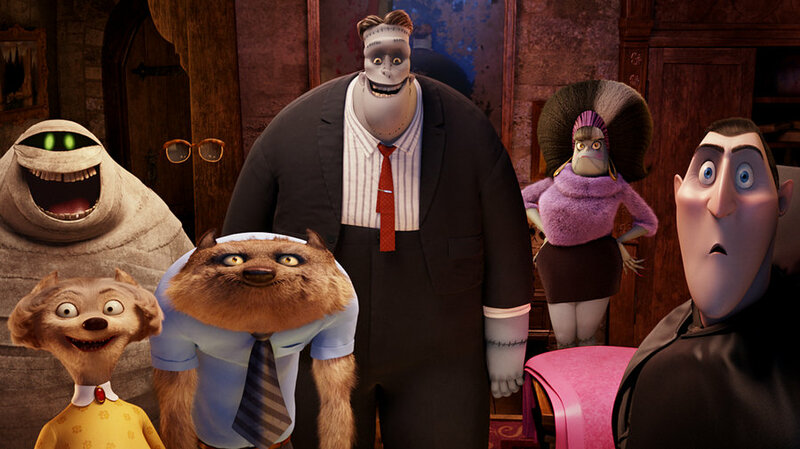 It’s a movie for kids and if they can use monsters to get big picture messages about acceptance across to these viewers, then that’s pretty awesome. Now, the movie does this through a story about forbidden love and teenage romance. Like Romeo and Juliet, or any story about characters from different social classes falling for each other (West Side Story, to name another,) these two are from different groups that generally hate each other. And it’s a lot of fun watching the ways that the girl’s father, Dracula, (Sandler,) tries to stop the two young love birds from getting together. 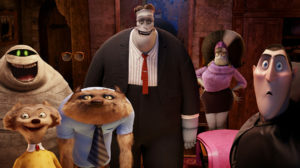 Let’s just say he takes Jonathan, the human (Sandberg,) to every part of the hotel he can think of, where Mavis (his daughter,) won’t be around. The movie takes it’s time to even introduce us to Jonathan, though. And this is a very good thing. It brings us into a new world and then wisely begins by establishing that world and the rules of how it exists. We open with a little baby vampire, (Mavis, as a baby,) in a crib, and then see Dracula taking care of her. Then we move back to see the hotel and walk around the lobby meeting all the guests. Dracula is the man in charge. He owns the hotel and lives here all the time, whereas the other monsters are just visiting. The story of this one is really about Mavis and Jonathan. Mavis has had a desire to meet and spend time around humans from long before Jonathan ever stepped foot in the hotel. She has that princess desire to get out and see the world (The Little Mermaid, Aladdin, Moana,) and her father restricts her. At one point, he plans an elaborate trick. He lets her go into town and then gets a bunch of zombies to dress up like humans, (complete with human masks and everything,) and then to come after her with pitch forks and weapons. This turns Mavis off to the idea of trying to go see humans again. And then Jonathan walks into the hotel. Watching Jonathan, an excited young back-packer, realize what this place actually is, happens to be a lot of fun. At first Jonathan comes in all excited, thinking everyone is wearing costumes, and slowly he realizes that these are actual monsters. Dracula helps calm him down, and then tries to get him out of the hotel. Only that turns out to not be so easy. And when it seems that Jonathan is staying, and it will only be a matter of time before he runs into Mavis, Dracula comes up with another scheme. He disguises Jonathan to look like a monster, and convinces Frankenstein that Jonathan is his relative. Hotel Transylvania is a pretty fun movie. It’s built on a great initial idea, and the romantic story that is put into this setting, might be familiar, but it’s still kind of enjoyable. Especially when the movie continues to find more jokes and use for monster ideas. Just look a pool scene, where Frankenstein uses a sea serpents tentacles to create a high diving board and then jumps and lands in a green jelly-like slime creature. For Adam Sandler, this is by far his funniest and most creative movie in years. Sandler’s comedies are generally pretty awful, (ever since his firs three great movies… Billy Madison, Happy Gilmore, and The Wedding Singer.) He’s been on a downward trajectory ever since, and those movies were about two decades ago. But they were enough to make him a big, recognizable star and a box office hit. He continues to make lousy live action movies, (most of which go straight to Netflix now,) but it’s nice that with this animated series he has finally found a property that works. If this one explores such a familiar romantic story and still manages to be pretty good, then perhaps the sequels are even better. I look forward to finding out.